Where is South Florida’s Future Development Heading? Ron Bergeron’s success did not come easy. At the age of 18, he left home with $235.12 in his pocket and started clearing land with a machete, a rope, and a 1954 Mercury truck to drag off the trees. 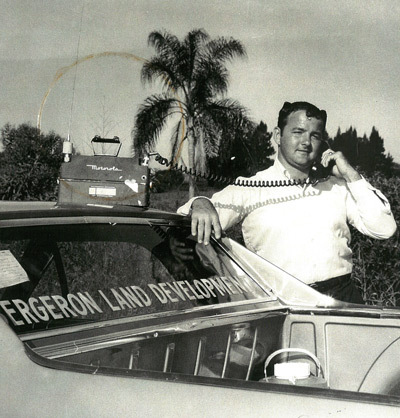 His first business, Bergeron Land Development, took its first big step when he bought a 1943 Ford Ferguson tractor. After the land clearing work started to slow he bought his first bulldozer and went from building driveways to building one of the largest contracts in the state at the time, the I95 – I595 and Sawgrass Expressway, I595 – I75 Interchanges. Bergeron Land Development is one of the most successful and largest site development & roadway contractors in the State of Florida. In 1989, Ron developed a real estate brokerage and property management firm he named Bergeron Properties & Investments Corp (BPIC). BPIC specializes in the commercial and industrial real estate industry specializing in Real Estate Development, Entitlements, Asset Management, Leasing, Marketing and Property Management. BPIC owns real estate of various investment types from the Florida Keys to Michigan. One of the largest is the Bergeron Park of Commerce & Industry, a 300 acre industrial/commercial park in Pembroke Pines, Florida. Another tremendously successful company which was founded by Ron’s oldest son, J.R. Bergeron, is Bergeron Emergency Services, Inc. which has assisted various Communities, Federal, State and Local Governments with Disaster Relief Efforts since 1992. In 2005, BES opened and managed five of the largest Temporary Debris Staging and Reduction Sites (TDSRS) in the history of the state of Florida and successfully conducted site management operations of debris in excess of two million cubic yards. In 2009, as a prime contractor for ice storm operations in the State of Kentucky, BES was the only contractor in the Commonwealth’s 12 districts who received an outstanding work performance grade from the District headquarters in Frankfort, Kentucky in the six counties awarded to BES. To eliminate the need for the SFWMD to construct a new seepage canal and pump station, Bergeron will expand the Stormwater Treatment Area (STA-1W) in Palm Beach County. The project includes developing 4,600 acres of inactive farmland, and the excavation and embankment of 3.2 million yards to create canals and levees. To accommodate the ever increasing traffic of Florida’s west coast, Bergeron will widen 1.38 miles of SR 45A/Venice Bypass from Gulf Coast Blvd. to north of Bird Bay Dr. The project, which began in November 2015, will turn the existing roadway from a four-lane to a six-lane divided highway.